Looking for a baby shower candy bar game? Here are some games to get your mouth watering and your senses heightened. These creative baby shower games take candy bars to a whole new level! 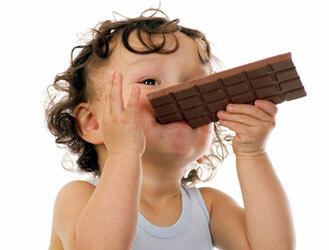 Now you can mix the enjoyment of chocolate with the celebration of babies! Feel free to twist any idea to make it a perfect fit your next baby shower party! mmm...mmm...Good! Guess the Candy Bar- Pass around disposable diapers that have had candy bars melted in the microwave. Label the diapers and hand the guests a sheet of paper to write down the numbers and which candy bar is in each diaper. The last time I played this game almost everyone got the candy bars right. You might want to make it a little harder by using brands that are not as well known. It is really funny to see people smell, and sometimes even taste the candy bars. Name that Pregnancy Term- For this game, you will need to prepare a list of different candy bars that have connections with pregnancy items. For example- a contraction can be a whopper and a hospital bill can be a pay day. You can also give out candy bars and have the guests try to make their own pregnancy names. Creative Baby Names- Split up guests into team. Pass out candy bars to each group and explain they have to find a baby name for the candy bar. Twix can be twins, Three Musketeers can be triplets, and so on. Funny Stories- Split up the guests into teams and pass out a selection of candy bars. Pass out a marker and poster board to each team. They need to make up a story including the candy bar names. There are so many subjects that can be used...the pregnancy, life with a baby, hospital delivery, etc. Have the mom-to-be choose her favorite story and that team gets a prize. Pass out miniature candy bars to everyone for their hard work. Then the posters can be given to the mom to remember the shower with. Variation: Start out a story for them to continue using the candy bars. Guess What It Is!- Fill baby diapers with things like crushed candy bars, rocky road ice cream, mustard, chocolate cake, etc. Set up a table for guests to view the different diapers and determine what the baby ate! The one with the most correct answers wins a prize!